One other possible place for introduction of the Book of Ether is after the Book of Mosiah, The Book of Mormon and another Mormon scripture – the Book of Moses – describe a continuous narrative involving the provenance of prophetic records and interpreters. These records were presumably carried from Canaan (Moses 6:46) to the New World by the Jaredites (Ether 3:23-24), transferred to Mosiah II (Mosiah 8:13-18; 29:20), transmitted through Nephite prophets to Helaman (Alma 37:21, 23-24; Helaman 6:26-27), then translated and sealed by Moroni (Ether 4:5) for ultimate recovery by Smith (JS-H 1:35). In the 1827, Book of Mormon, Rigdon may have deleted the Book of Moses to use it for future revelations, leaving the Book of Ether. Book of Moses – saved for later use as “brass plates”, modern revelation. 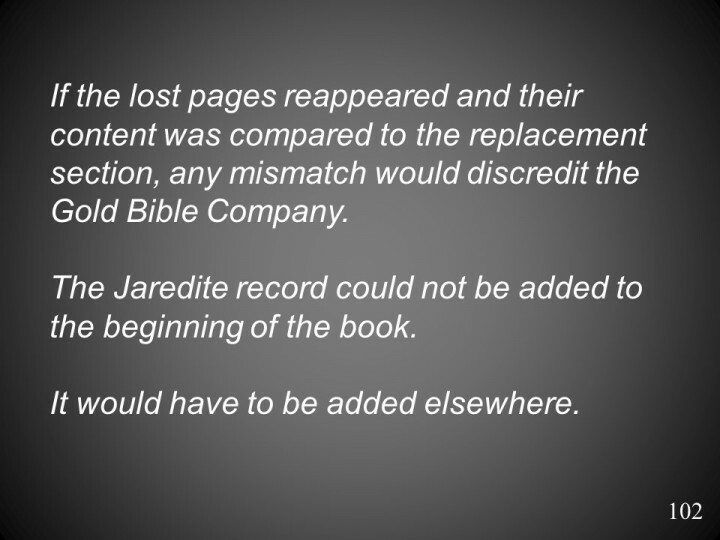 But after the lost pages, it may have made more sense to move the Book of Ether to after the Book of Mormon. But why? To enable add-ons with Moroni?